Android 2.2 update for the Motorola DROID X expected to arrive tomorrow? 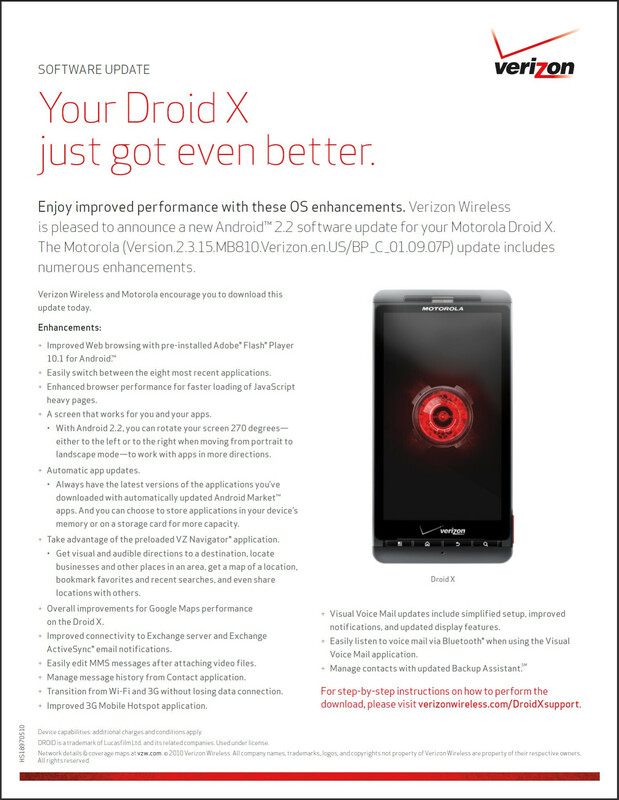 Owners of the Motorola DROID X are going to have a riot knowing that the highly anticipated Android 2.2 Froyo update might very well be on its way after Big Red updated their DROID X support page. After having to deal with DROID 2 owners showing off its ability to play Flash content so eloquently like on a desktop browser, it's rumored that the update for DROID X users will land this coming Wednesday – tomorrow! Naturally, the update will bring support for Flash 10.1, the ability to automatically update applications, Google Voice Actions access, a 270-degree screen rotation, and many more goodies to keep owners satisfied with their purchase. After a good 2 months since it launched, it's nice to see Motorola getting this update into the hands of those patient owners. So make sure to check your handset tomorrow to see if Verizon intends on rolling it out. Crossing fingers, but not holding breath. Either or, I still have a great phone that does everything I need and more. I wish this update would some how magically improve battery life, i am not complaining, but i am seeing a steady decline in the battery power lately. Explain about the task killers? If yes I already did on another post and i'll send you the link. Yes please send the link. my dad will be happy if this is true coz he's tired of me joking at him using my Droid 2 around him for payback when he joked at me when he got his Droid X. good luck when you get Froyo because your task killers won't work anymore. http://www.phonearena.com/htmls/DROID-DOES-web-site-appears-to-predict-Froyo-upgrade-for-DROID-X -article-a_13254.html Start at the top of the comment section and just read what i've posted... Some people disagree with my opinions but I have tested it quite a bit. Thumper you should also go to the link I just posted, everyone who is up in arms about their task killers not working anymore is looking at this the wrong way. You don't need task killers, and by using them you are generally hurting your battery life.... so by them making it so that task killers "dont work" on certain apps, they are actually helping your battery life which in turn is helping you. it seems your link is no longer working. i think i know the difference in my phones performance when there's an abundance of running apps in the background and when there's not. i'm not knocking this theory of yours i've yet to see but unless it includes an evenly efficient fix as task killers then it's not real helpful to me. cc16177 i just read your comments on the other article and i have some things to add, most task killers like my preferred one Task Panel X have these "ignore lists" that allow you to as the name implies ignore runnings apps placed in the list. i personally never used it because i didn't know shutting down apps affected the battery but to all of you people that see it like that they can make use of the ignore list and put everything in it that doesn't use a lot of cpu. i have a Droid 2 and even with a 1ghz processor and 512mb of ram my phone can get sluggish when i use a plethora of apps. this is a problem because of Froyo and Froyo is the problem because there's no working task killers. There is definitely a way to get the app killers set up to benefit you, but even after all that work the battery life increase is very minimal. I have tested it both ways and in my personal experience the "average user" would not benefit from any task killers. All I know is I have froyo on my Droid X and I push my phone to the limits. I do not notice very drastic speed decreases and I do not use any task killers. I do notice that I get substantially better battery life than almost every single person i've talked to who uses task killers, and that has been my personal experience anyways. Everyone uses their phone differently but for the majority of users, blindly using a task killer will not benefit their battery life at all. Also, nothing I have talked about on either article is related to performance, i'm just saying task killers do not help battery life and generally have the opposite effect. that comment was made before i found your comments on the other article. well saving battery life isn't the biggest problem to someone like me who has like 8 applications running simultaneously, it's my performance and i am just voicing that the option of using task killers should be there in such cases. say good by to your motorola turds, because this will be like every other android update. your phones will turn into bricks. Can you please kill yourself already? why? because i hurt your feelings? did i bruise your ego? spare me your tears, child. when you grow up to be a big boy, you will learn that we get amusement by making fun of your toys and watching you turn red in the face with anger. now grab your binkie and take a nap before you soil your diaper. FOR THE LAST TIME! WHAT PHONE DO YOU HAVE derp? Look at this TUFF guy. ^^^^ All caps FTW. Derp you are quite the comedian. No, your posts do not hurt my feelings. No, posts on the internet do not bruise my ego and trust me i'm not shedding any tears. The reason I don't like your posts is are because they are complete nonsense. Nothing you say ever has any merit and it does not contribute to this website at all. As far as watching my face turn red with anger you must be stalking the wrong person. As far as your comment "when you grow up to be a big boy, you will learn that we get amusement by making fun of your toys and watching you turn red in the face with anger" ... I would think that would be the opposite of being a "big boy". I thought most people grew out of mindlessly making fun of other things and people for no reason around age 12 or 13, I know I did. I'm not advising him to kill himself, i'm begging him to. And it's not because he's offending me it's because his comments are never productive in any way and anyone here who has read more than one of his posts would agree. Hmmm...you sound pretty offended to me and plenty of other people. Its funny how you contradict yourself in your posts. Your holier-than-thou attitude is quite amusing as well. Yet i would have to agree with derp and misanthropos. While most people would just skim over the trolling, you clearly cant handle when your toys are called out for falling short or disappointing. "I thought most people grew out of mindlessly making fun of other things and people for no reason around age 12 or 13, I know I did." Um...no. No you didnt. That much is obvious. You might have convinced yourself that you have achieved a higher level of importance than anyone else, but nobody else is. So instead of digging yourself a deeper hole in this irrelevent conversation, go take a deep breath and calm down. The world isnt going to end because someone made fun of your toys. Holy crap you are totally right. I really need to re-think my life and how I post on online forums, thank you for your valuable input. i am going to call a friend of mine who is quite high up in verizons corporate staff. if he does not answer, i will leave a message and have him get back to me. i want to settle this once and for all. AFFIRMATIVE! it is available NOW if you take your phone to the store, it was APPROVED. now a call to the store, and it HAS been pushed to a few people already, its just a matter of patients now.